Are you tired of living with the challenges of missing teeth? If traditional forms of tooth replacement have failed to give you the results that you want, Brooks Dental has the solution you need with dental implants in East Boston. As the most predictable and reliable option to replace your missing teeth, you can make a true investment in your quality of life and oral health. Before you are ready to commit to the procedure, you likely have several questions. To help you make the right decision, we have the answers you need. The success and benefits of dental implants relies on the use of a biocompatible implant post, which is surgically placed into the jawbone. The body naturally accepts it as a tooth root, fusing to it to create a secure bond. 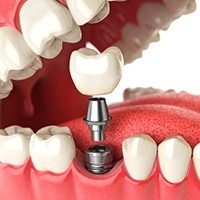 An abutment is connected to the implant post to allow a custom-made dental crown to be attached to fill the empty space. If you are missing several teeth or all your teeth, you can use dental implants to hold the bridge, partial, or full denture in place. Dental implants offer over a 95% 10-year success rate. With the right aftercare, like maintaining your oral hygiene and regular dental appointments, the implant post can easily last for a lifetime. 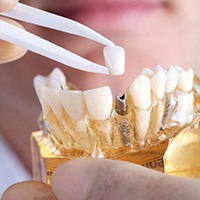 The dental crown will suffer from daily wear and tear. On average, it will need to be replaced about every 10 years. More than 500,000 dental implants are placed every year due to the various benefits they offer. In addition to offering a long-term solution, they closely look and feel like natural teeth. In addition, they are the only tooth replacement option that can preserve your jawbone’s density from the complications of tooth loss. The implant post stimulates the jawbone to encourage new bone growth, allowing you to protect your remaining natural teeth and facial structures from complications. Generally, if you have missing teeth and good oral and general health, you are a candidate for the treatment. Your medical history and lifestyle habits will be discussed to ensure that your risk factors for implant failure are minimal. 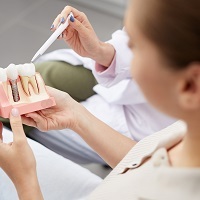 In some cases, you may need additional procedures prior to being a candidate for implant placement, such as bone grafting or tooth extractions. 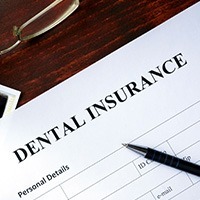 In most cases, your dental insurance policy will not pay for the treatment; however, it may cover the cost of certain aspects of it, such as the dental crown, sedation, or tooth extractions. Can I Smoke with Dental Implants? Smoking and tobacco use of any kind lowers your body’s ability to heal and fight infections. As a result, it is best to avoid tobacco in any form to decrease your risk for implant failure. If you are ready to see if dental implants in Revere are right for you, it is time to schedule your consultation with Brooks Dental, P.C. We will restore your smile with an effective solution.